There are many amazing birds of prey in Africa, but there is one that is undoubtedly the "king of the African sky" due to its beauty, splendour and hauntingly evocative, distinctive call. 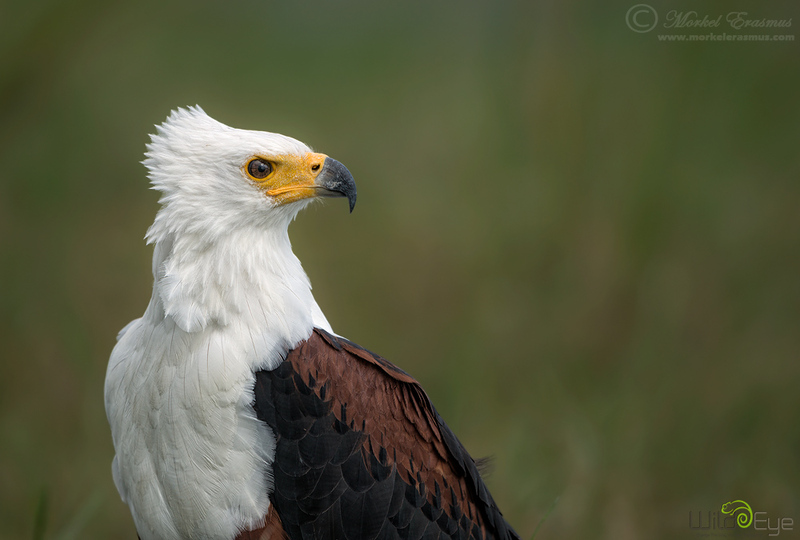 I am talking about the African Fish Eagle, of course. During our recent Wild Eye photographic safari on the Chobe river that lies between Namibia and Botswana, we had some amazing encounters with these birds. This particular female was sitting on the edge of the river and we were able to glide our specialised photographic boat right up to her and capture some striking portraits. It's not every day you can be this close to a raptor in the wild and capture these images (the ones you normally see are taken of birds in captivity or in rehabilitation centres). This photo is pretty much full frame at 36 megapixels, and the details are mind-blowing. I particularly love the tuft of feathers blown up by the wind on the crown of her head. I opened the aperture as wide as it can go to smooth out the green riverbank behind her and create a pleasing separation between subject and environnent. I was hand-holding my lens, so I pushed the shutter speed to a high enough value to compensate for possible camera shake. I used the amazing Nik Color Efex 4 plugin to extract some more detail and contrast from the bird - since the conditions were overcast and the light was flat. I can hear his call in my head looking at that shot! Great details in the whites Morkel. Always a ball to photograph them! Hi Jaco - thanks for your comment, yes they are amazing to observe and photograph. Terrific shot! Congratulations! It´s always such a thrill to encounter these wonderful animals, especially when they allow you to get that close!